In the Limon province, on the shores of Costa Rica's Caribbean Coast lays the attractive town of Puerto Viejo. Crystal clear and blue water line the shores of this popular destination which is only 34 miles south east of Puerto Limon, and 10 miles south from Cahuita. Puerto Viejo is also famous for being a surfing destination and having a relaxed atmosphere with a mix of Latino, Afro-Caribbean and Bribri indigenous cultures. Locals usually speak their own language called Patois (pronounced "patua") which is a mix of Afro-Caribbean English, Spanish and French. 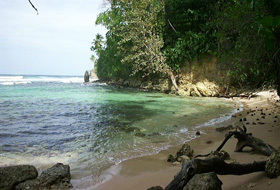 Puerto Viejo is a lively place for younger tourists to have an exciting and relaxing vacation. This area offers a lot of attractions and activities in a laid-back ambience. Puerto Viejo’s Salsa Brava beach is very famous for surfing and its golden sandy beaches with crystal clear water, its tropical vegetation and other atractions such as the Cahuita National Park, the Talamanca Indian Reserve and the Gandoca Manzanillo Wildlife Refuge. Horseback tours in the area, as well as snorkeling, diving, mountain biking, kayaking or boogie boarding are some of the activities that travelers can enjoy in Puerto Viejo. There are many colorful bars, restaurants and hotels. Nighlife is exciting, and you can hear music during the day and at night in most areas of town.